Sharp-tongued campaigner Laurie Kazan Allen clearly has no qualms about besmirching the good name of those who disagree with her. Having expected the Thai government to simply roll over and approve a ban on chrysotile, she didn’t take kindly when a minister questioned whether the move made any sense. 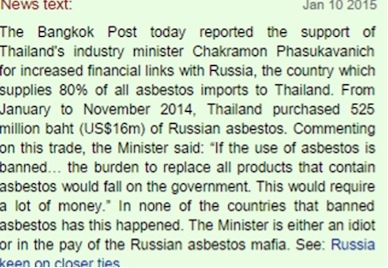 The Thai Cabinet has rejected the proposed ban citing the lack of evidence of asbestos-related disease in Thailand. Having posted this malicious falsehood on her riveting website, hasty backtracking on this outrageous libel followed. No doubt fearing a visit from highly paid lawyers who aren’t her brother, Kazan-Allen attempted to delete her smear, although Google cache preserves it for posterity. Instead she now claims the Thai government was guilty of a “crime against the people” and demanded “clarification” or, she warned, “we will have to draw our own conclusions as to your motivations”. Of course there are no such issues surrounding Kazan-Allen’s motivations, or that of her wealth lawyer brother, who funds his luxurious California-lifestyle with the proceeds of asbestos lawsuits.